Fudge is a dear little rabbit who hasn’t had the easiest of starts to life, he is only 6 months old and a previous infection has left him with a head tilt, this certainly doesn’t seem to get in the way of Fudge enjoying life. 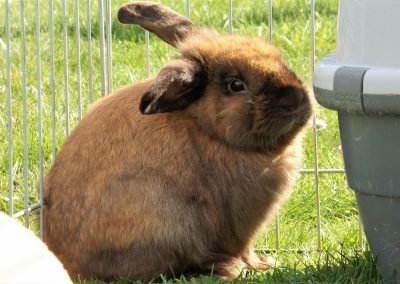 Fudge loves to be out in the run lapping up the spring sunshine having a good old munch on the lush grass, he is an inquisitive bunny and likes to investigate any visitors. Fudge will be neutered, chipped and fully vaccinated prior to being rehomed.